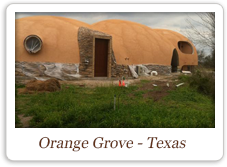 Dome Home in Orange Grove in Texas. Mahogany stained wood custom windows and doors. Check out the article and get the best collection of Internal Doors and design. Create the best home environment.